Funded by the NSF’s Assembling the Tree of Life program, our project collected over 32 kilobases of DNA sequences for each of more than 200 representative species across the diversity of modern birds. Hackett, Kimball, Reddy et al. (2008) reported a well-resolved phylogenetic tree of modern birds with many novel and highly-supported, deep relationships. Our analyses also show extremely short internodes at the base of modern birds, indicative of a rapid radiation. Birds exhibit considerable heterogeneity of evolutionary rates within and across lineages. The complexities of nearly simultaneous divergences combined with varying rates of evolution have contributed to the difficulty associated with resolving the phylogenetic history of birds using either genetic or morphological data. Subsequent studies from other labs have corroborated many of the novel relationships uncovered in our study. The Old World tropics, including Asia, Africa, and Madagascar, comprise a biogeographic realm with past geological and biotic connections such that groups in each of these areas often have close relatives in neighboring regions. 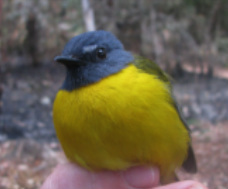 My work in these regions has expanded our knowledge of the species-limits, phylogenetic relationships, and biogeographic patterns of songbirds. Some of this work is funded by NSF. The avifauna of southern Asia is one of the most diverse in the world, with tremendous species richness and endemism. 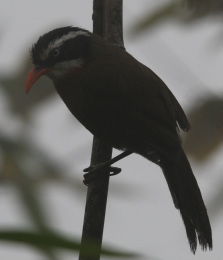 Babblers form a major component of the tropical Asian avifauna and are an ideal group for examining patterns of diversification. Through detailed analysis of museum specimens and DNA data, I examine morphological, genetic, and geographic information to assess species-limits. My studies show that diversity of Asian birds is dramatically underestimated. 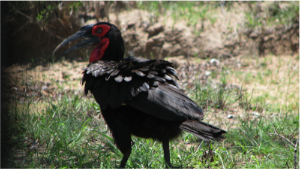 Madagascar is unique in having several avian endemic radiations. Vangas are a classic example of an adaptive radiation, yet many questions remain regarding the diversification of this group. In Reddy et al. (2012), we showed that this ecomorphologically diverse group is monophyletic and includes several disparate species that until recently were classified with other families. We demonstrated that vangas explosively speciated upon colonization of Madagascar with subsequent increases in diversification into novel niches. 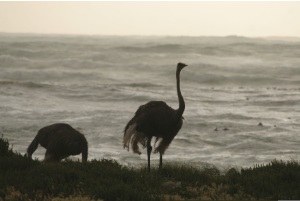 My association with the Field Museum has allowed me to participate in field expeditions to Africa and samples from these surveys have provided valuable new insight into African biodiversity. In one study, we described a new, cryptic bird species in the Laniarius complex (Voelker, Outlaw, Reddy et al. 2010), which remained undetected until modern surveys noted soft tissue characteristics (iris color in this case) and more specific locality information helped distinguish this evolutionarily distinct lineage. My association with the National Centre for Biological Sciences (India) allowed me to participate in a project to examine the genetic diversity of birds on the Andaman Islands. In 2013, we conducted a pilot survey and are currently in the process of analyzing the genetic relationships of several Andaman species. ​new insights into how constrained or adaptable different penguin traits are, and how species are likely to respond as their environment changes in the future. These projects receive funding from the National Science Foundation, Loyola University Chicago, The Field Museum of Natural History, and the National Centre for Biological Sciences (India).